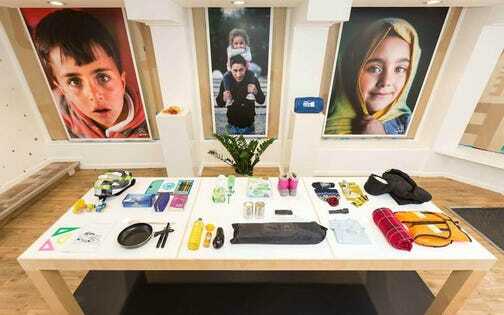 Telegraphing the booming potency of ethical brand initiatives but also a critical return to credibility for an industry in crisis, Choose Love – the retail wing of U.K.-based NGO Help Refugees, where visitors buy real items for refugees including gloves, blankets, life jackets and nappies – has already surpassed all expectations by racking up sales of £1.4m ($1.77m). That’s put it on track to double last year’s revenue with a £1.5m pay day by Christmas Eve, when the two physical stores in London and New York will retire for at least another year. Component one is a suite of founders with as much media savvy as honorable intentions. Help Refugees was established in 2015 by three woman with zero charity (or retail) experience – writer/broadcaster/presenters Dawn O’Porter and Lliana Bird plus Josie Naughton, now it’s CEO, who had been a PA in British band Cold Play’s management team, formerly a licensing executive for TV production company Endemol. The intention was as grass roots as it gets – to raise some funds, get a van and go to Calais with supplies for those in the infamous Jungle camp. Live Aid it was not. But the donations mushroomed, as did the celebrity endorsements and the most everyday of things – an Amazon wish-list – that exploded with well-wisher’s additions became the genesis for the Choose Love shops in London and New York. Built in collaboration with British creative collective, Glimpse, they opened on Black Friday (both years) – broadcasting their mission to reroute what’s becoming a frighteningly standard consumerist frenzy. As mentioned, their wider pop cultural acumen was a game-changer and far beyond their celebrity black books: “My skills working with a global band with merchandise have been very translatable,” says Naughton, whose understanding of social media and particularly the nuances of a world in which images are digitally distributed, devoured and either acted or dismissed in nanoseconds has paid dividends in making the stores a mainstream success. ads revealed that the image that resonated most with audiences, generating the highest click-through, wasn’t the ones showing refugees in the midst of a struggle it was those depicting queues outside the store. City shoppers, a cool looking store. Slogans including “shop your heart out” call out to the buzz of a recreational retail splurge. Shots of two women hugging (“showing beauty and agency”) also connected with users. There was also the masterstroke of resurrecting British designer Katherine Hamnett’s archetypal slogan t-shirt. Hamnett was the high priestess of the original political 1980’s statement tees – a formidable part of the era’s anti-capitalist pop culture push-back. The Choose Love t-shirt by Katherine Hamnett, the original architect of the slogan t-shirt. (Credit: Choose Love).Choose Love. Let’s not forget that the Choose Life t-shirt was famously adopted by Wham! (George Michael, of course, latterly going on to be something of a revolutionary himself) and referenced again in the film Trainspotting in which lead character Renton’s ‘Choose Life’ monologue taps into the spiritual vacuum incubated by an ultra-consumerist society. “People are becoming more frustrated by consumerism at this time of the year, we wanted to create an alternative. The dopamine hit you get when you buy something seems to be even higher when it’s a charity .” says Naughton. There’s also this year’s collaboration with legendary ultra-stealth street artist Banksy, who’s donated a sculpture to the London store for a ‘guess-the-weight’ raffle. Just £2 a guess. So far, so deliberately school fair. Secondly, the premise of the store is beautifully simple. Visitors shop as in any other store (both spaces are attractive-looking boutiques), with items being both genuine practical necessities but also highly emotionally charged by virtue of their ordinariness, so heartbreakingly relatable in their humanity. There’s a mother and baby bundle that would melt even the coldest heart. “All the items are things that are needed right now, they’ve not been engineered to elicit the most empathy but it’s impossible to separate the two. The key thing is that it’s very tangible, people can see where their money is going,” says Naughton. There’s also an option to buy services or amenities like meals or accommodation for a family for month. Prices range from £3 ($4) for supplying a hot shower to £10 ($13) for a child’s coat – entry level spends that’s made the store as accessible to teenagers as their parents – to £599 ($756) to buy the entire shop, i.e. one of each of the items. Foundation (£150k) and Mountain Philanthropies (£250k). It had 12 days to do but made it in 7. ’s East London (Stratford) mall is currently hosting The Drop – a streetwear rental concept benefitting Big Up Uganda, a Save the Children initiative. But Choose Love, as an ongoing project, may yet prove to be the concept that broke the mould. What’s next? Possibly pop-ups in new locations next year, definitely more bundles of products after the runaway success of the ‘buy-the-store’ concept and maybe even at other times of the year such as a summer festival. Then again, it may be kept to the inimitable wonder of Christmas: “At the moment we won’t go past Christmas,” says Naughton “because there’s a sense of the magic spell being broken”.